Zombie Walk Season 2010 - Zombiewalk.com - Your source for all Zombie Walk and Zombie Flash Mob planning! Good evening Seattle Zombie Walk, we are excited for this year in zombie because as always we have a great time and keep getting better. The Zombie mania is still blossoming everywhere you turn, from movies to music you can’t escape it. We have a lot planned and as the season rolls along we are always approached with more events to crash.. I mean Join! This year we plan on two major walks with smaller walks in between. Who: EVERY ZOMBIE IN THE NORTHWEST! Why: Because we proved to the world we could break a record and bring the zombie madness to Seattle. This is our celebration of that event. SEATTLE LOVES ITS ZOMBIES AND THEY WANT THE HORDE!!!!! Our Seattle Zombie Walks have drawn attention from all around the Seattle communities and they want us to bring the zombie horde fun to them. the Northwest’s largest science fiction convention, a gathering of fans of various forms of fiction ranging from literature, movies, television, comics, animation and games. They are giving us space for a discussion on zombies, such as how to put on make up and how to zombie shuffle. We will have a large walk through the convention and end at the con dance for a coordinated thriller dance. When: April 1st for the Zombie Walk, Zombie fun and mayhem throughout the weekend!! 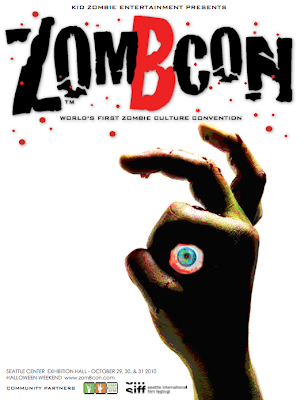 Cost: Just Thursday $30, all weekend $60 long story short if you want to be a zombie at this convention you need to be in the convention to get access into the rooms where most of the action is taking place. A wild and wacky parade with all forms of art and individual expression. Every year a group of zombies brings the rot, lets bring the Horde and join forces! Both Seattle Pride and the Seattle Goth Community have asked us to join the Seattle Pride Parade this year! The pride parade is about Unity, Honor Diversity, and Achieve Equal Human Rights throughout our Region and the World. What do we have to offer? ZOMBIE PRIDE! ZOMBIES ARE PEOPLE TOO! We have been asked to help out the growing number of zombie rock bands and special clubbing events, keep an eye out for future late night fun. Why: To celebrate another amazing zombie season after the last zombie walk of the year, we need every guy and ghoul to dress up in the finest rotted apparel for a Zombie Prom. Last edited by seattlezombiewalk; 03-20-2010 at 02:01 AM.